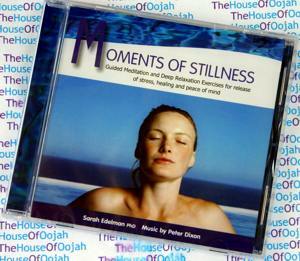 Moments of Stillness contains two half-hour tracks comprising a series of relaxation and meditation exercises spoken by psychologist Sarah Edelman to a background of ambient music by Peter Dixon. Both tracks contain a range of exercises designed to create deep physical relaxation and internal stillness. The guided meditations include a focus on the breath, mantra meditation, a healing blue light, affirmations and observing the present moment. These exercises are ideal for both novice meditators, as well as those with more experience who wish to develop their meditation skills.